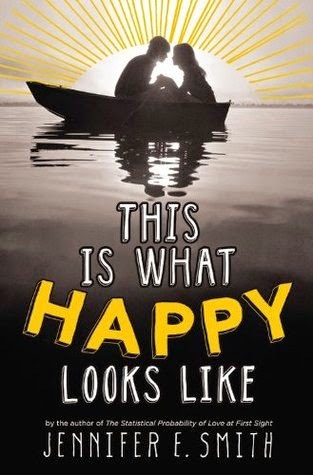 Today Imma tell you about This is What Happy Looks Like, written by Jennifer E. Smith! Then Graham finds out that Ellie's Maine hometown is the perfect location for his latest film, and he decides to take their relationship from online to in-person. But can a star as famous as Graham really start a relationship with an ordinary girl like Ellie? And why does Ellie want to avoid the media's spotlight at all costs?" Anyway, to clarify my statement above, I picked this book up at the Library on a whim because I'd been wanting to read it many times before. Personally, I am a huge fan of adorable, preshy feel-good stories, and this sounded exactly like what I needed after my depression due to finishing Shadow Kiss, book three in the Vampire Academy series by Richelle Mead. And that's what this book was, don't get me wrong. It was so incredibly sweet, and the characters were absolutely beautiful. It was realistic but not over dramatic and I kept waiting for something to go wrong but the characters were so well written and they never exploded about stupid stuff. I thought they would, many times, because that's what every other romance book has me believe--the two love interests are desperate and dramatic and just UGH--but these two? They were perfectly reasonable through it all, and to me that proved that they were worth it. It proved that, in all of the modern crap we have in books these days, that there can be--and are--characters that actually FIGHT for what they love. Fight for each other, instead of pulling each other further downwards and making stuff worse. It was very refreshing and new from what I usually see in YA Romances. Since you all must very well know by now that it's all about the characters for me, let's talk about them, shall we? From the little bit about the book above, we don't nearly get enough insight into how pretty the characters are. Graham is our leading lad (Omg I just used the word 'lad') and he's grown used to the spotlight. At the beginning he may sound a bit Cliche, but I swear he is anything but. Because each chapter flips POV, it's really neat getting to see inside his thoughts. He misses his parents who feel uncomfortable around his filming life and he's at first annoyed by the girl that's acting as his love interest in the movie that he's starring in and ultimately he just wants to find a house in this little town and spend time with Ellie. But this is the really great part: Though he's unhappy with the way his life is, he never complains. No. I'm not kidding. He doesn't throw fits and mistreat his Co-Workers and isn't rude to his fans. This little fact showed a bunch about his character and who he is, and I jumped in joy. A NICE leading guy! That's a very rare thing! And then we have Ellie, our leading lady, and she was truly the 'ideal girl'. She has so much to her that would be impossible to touch on it all within this review, but I adored her in every way possible. She was believable and wise and kind, and together her and Graham made the most precious pair. There were many supporting characters that were all done as they should be: double sided and well crafted. Have you ever read This is What Happy Looks Like? What did YOU think?